Introducing the TPX™ Motorcycle Laser Jammer System. Adaptiv Technologies took the world’s best laser jamming technology and created a system specifically designed for motorcycle use. While radar is still widely used, laser (a.k.a. LIDAR) is quickly finding its way into many law enforcement agencies’ arsenals . Unlike radar, the beam emitted from a laser gun is very narrow and doesn’t tend to scatter. This makes early detection extremely difficult, if not impossible. Typically, by the time a radar detector alerts you of a laser signal, the gun has already recorded your speed. The TPX™ Motorcycle Laser Jammer System eliminates this situation by jamming the laser signal and preventing the gun from obtaining a speed reading. The TPX™ Laser Jammer System can be used as a stand-alone system or in conjunction with the TPX™ Motorcycle Radar and Laser Detection System. One plug and you’re set! An ultra bright LED alert, audio output port, front transponder, control switch, and mounting hardware are all included. To keep pace with ever advancing technology, the system has an USB port which allows for free software updates. The TPX™ Laser Jammer System is smarter than the average jammer. 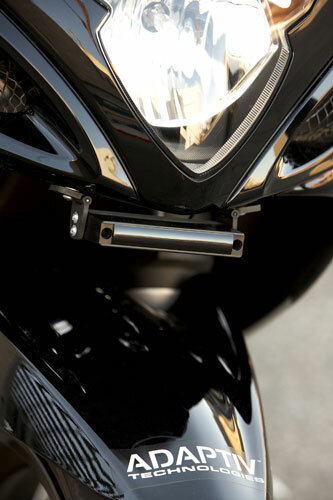 Its auto-shutoff feature allows you to concentrate on slowing your bike down instead of operating the Jammer. The system is waterproof, vibration proof, and simple to operate so you can focus on your ride. The TPX™ Laser Jammer System is powered by patented Blinder® technology. Blinder® has been the undisputed leader in laser jamming technology since its inception. Its performance consistently tops all other jammers in the market place and its performance has been certified by Speed Measurement Laboratories, the leading independent speed-countermeasure testing lab.